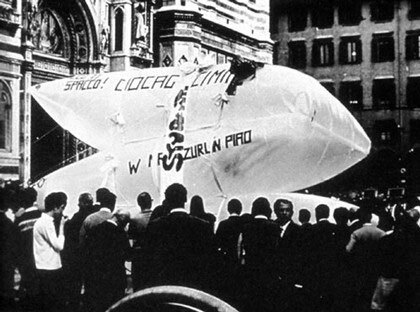 The UFO group was founded in 1967 on the wave of the student protest within the faculty of Architecture, at the University of Florence, by Lapo Binazzi, Riccardo Foresi, Titti Maschietto, Carlo Bachi e Patrizia Cammeo. Their intention was to operate a transformation of architecture into a show, an event, an action of urban and environmental guerrilla. Thus were born the "Urboeffimeri" (1968) for the International Section at the Triennale, the "Case Anas" (1970), the "Giro d'Italia" (1972). Alongside with this theoretical and demonstrational activity, UFO also designed the interiors of restaurants and discotheques (Sherwood restaurant in Florence, Bamba Issa discotheque in Forte dei Marmi, 1969), in which stage-setting, ephemeral sets and furniture end up being identified through the use of materials like papier-machée, polyuretan, inflatables. In 1973, they joined Global Tools, where they continue their avant-garde research, accompanying their planning nihilism and their research on language with ideological committment, and a special attention towards social and political behaviours.